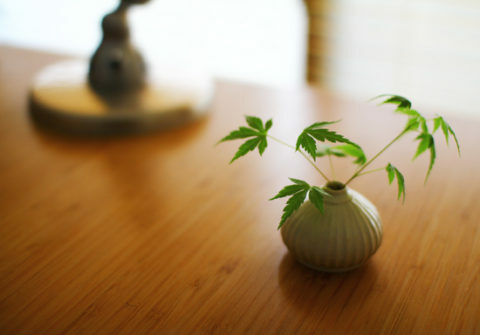 Maple bonsai tree has almost got its full set of leaves. It is lovely to see its energetic posture but the leaves which break the shape of the tree must be pruned. I cut them off with saying a words of apologize in my mind. I arrange them into a single-flower vase and they become a principal of dining table just for a little while. Since the tree grows really fast, I’ll have to prune them again after a little while. Photo: Pruned leaves and the table.